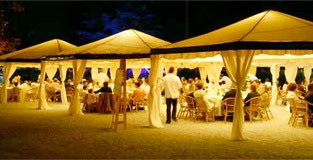 Count on the experienced staff at Uptown Wedding and Event Rentals to make planning your event effortless and enjoyable. We will help you get the most out of every dollar of your party planning budget. Why buy when you can rent from Uptown? Contact us for party supplies and event planning today! A fun time was had by all, everything was great. Rented a wet/dry slide and basic bounce house The guys outside are great to work with. Everyone had a smile on their face. Contact us today to discuss your upcoming wedding or event needs.